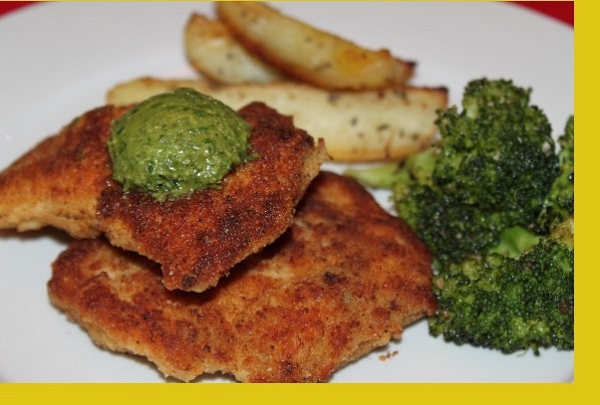 Parmesan crusted Crispy Chicken breast quickly sauteed and served with homemade pesto and oven roasted potatoes. In a wide bowl, beat eggs until frothy. Pour flour in shallow platter and bread crumbs on a plate. Lightly dredge both sides of chicken in flour, dip in egg wash to coat completely, let excess drip off, dredge in bread crumbs. Add 2 tablespoons of oil to a skillet and heat on medium heat. Saute chicken, in batches if needed, 3 to 4 minutes per side. Add more oil as needed. 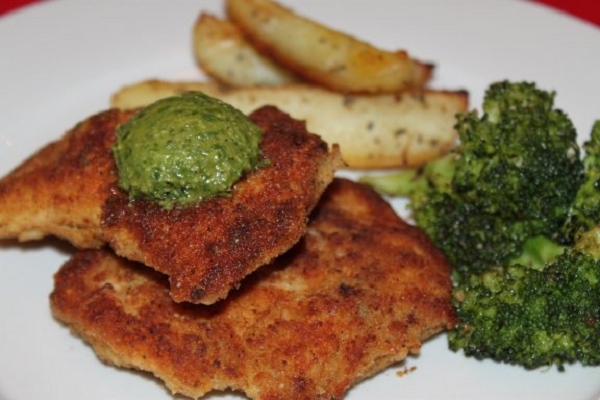 Remove and serve with pesto sauce and side of potatoes. I'm not a huge fan of white meat, but absolutely loved this chicken. It was so incredibly tender and flavorful. The potatoes complimented nicely. This was our first order and is our favorite to date. A meal anybody would like and the homemade pesto is AMAZING! This was very tender and juicy. Loved it! This was our first order but not our last. It was easy to fix and it tasted great. Will order this one again. This is my family's favorite dish from Maria. Even my 6 year old will eat the pesto by the spoonful. It's delicious! The Pesto Chicken was so tender & moist. All the seasoning for the chicken & the seasoned oil for the potatoes along with the pesto were just delicious. A very enjoyable meal! I am totally enjoying Maria's Gourmet meals. They are well seasoned and absolutely delicious!!! Excellent dinner! This is the freshest pesto ever! My daughter says that it it served with her favorite potatoes too! Try it and you will love it. Although all the dishes are great, this one is our favorite so far. My kids are gobbling it up as I type this review. Thanks for preparing dinner for us. This has been my absolute favorite! It is seriously delicious. I keep hoping for it to crop back up on the menu soon. :) The pesto is amazing, we even had some leftover to toss with some noodles later in the week. You can tell Maria makes everything from scratch with quality ingredients. Yum! This dinner was easy to make and very good. Portion sizes really good. Very happy! The pesto chicken was downright delicious! The breading for the chicken was seasoned perfectly and the potatoes were also really good. This is another dish that my family enjoyed. Husband said that it was so good that I needed to email Maria to let her know. Roasted potatoes with the dressing were very tasty. I am so glad I found Maria's website. This dish was great. The pesto added a delicious taste. I added a little of the pesto in the cooking process also.